Chicago—ALA Publishing eLearning Solutions announces a new facilitated eCourse in collaboration with the Office for Intellectual Freedom, Privacy, Libraries, Patrons, and the Law. Deborah Caldwell-Stone will serve as the instructor for a 4-week facilitated eCourse starting on Monday, April 8, 2019. The right to intellectual privacy—the right to read, consider, and develop ideas and beliefs free from observation or unwanted surveillance by the government or others—is the bedrock foundation for intellectual freedom. It is essential to the exercise of free speech, free thought, and free association. Librarians have long been committed to protecting the privacy and confidentiality of library users' information. But the past two decades have brought great changes to library service and the concept of privacy itself. New technologies, new and evolving laws and regulations, and transformative social change have made privacy a complex concept that can be difficult to master and apply. While we may understand our obligation to protect privacy in theory, what happens when we are asked by legal authorities to monitor patron behavior? To respond to subpoenas or warrants? What are libraries' legal obligations when collecting, using or sharing library users' data, and how do international privacy laws like the General Data Protection Regulation or the Right to be Forgotten affect U.S. libraries? In this new course, brought to you in collaboration with the Office for Intellectual Freedom, we will provide you with clarity and order on what can be a complex topic. You’ll learn about the legal framework for upholding your patrons’ right to privacy when it comes to both physical and digital sources of information. 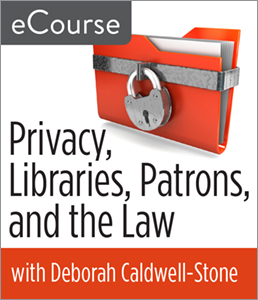 You’ll understand how federal, state and international data regulations apply—or don't apply—to the library, how contract negotiations can be a tool for protecting patron privacy, and how you can comply with the law while upholding your patrons' rights. Deborah Caldwell-Stone is interim director of the American Library Association's Office for Intellectual Freedom and the Freedom to Read Foundation. Before Caldwell-Stone joined the American Library Association in 2000, she practiced appellate law before the state and federal courts in Chicago, Illinois. She now works closely with librarians, library trustees and educators on a wide range of intellectual freedom and privacy issues, including the impact of new technologies on library patrons’ privacy and confidentiality. She has served on the faculty of the ALA-sponsored Law for Librarians workshops and is a contributing author for the Intellectual Freedom Manual. Registration for this ALA Publishing eLearning Solutions facilitated eCourse, which begins on April 8, 2019, can be purchased at the ALA Store. Participants in this course will need regular access to a computer with an internet connection for online message board participation, viewing online video, listening to streaming audio (MP3 files), and downloading and viewing PDF and PowerPoint files.